Why Should You Remove A Tree Stump? Tree stumps are unsightly. Your guests do not want to be met with the rotting or aging stump as they walk around in your outdoor space. It is indicative that you are not keen enough to maintain a well manicured home’s exterior. A stump will stand in your way when you are cutting the lawn, parking a vehicle or giving in to the demands of the young ones to run around the compound. By removing it, you have the liberty to use your compound as you will. A stump with an extensive root system must be removed because it may compromise the integrity of your building. Stumps are known to harbor a lot of root diseases. Honey fungus is the commonest of them all. Trees such as cedar, cherries, lilac, walnut, and willow are susceptible to the disease. Removing the stump will help reduce the food source used by the fungus to survive. Why Should You Engage The Tree Removal Experts? 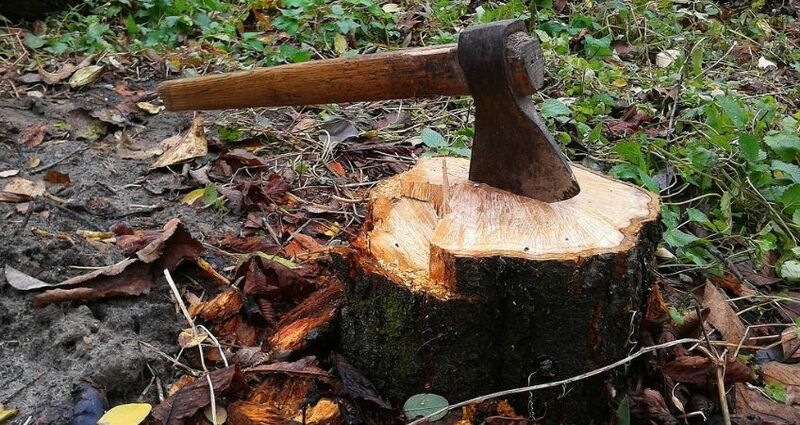 It may take you several days or even weeks to remove a tree stump. The professionals, on the other hand, have the experience and the skills necessary to complete the task within a few hours. You can attend to other issues in the meantime. Without a good plan and skills, you will leave the woodchips in your compound, creating a wrong impression of your capabilities to take care of a home or office. Engaging the professionals will solve the issue amicably. They will come with stump grinders to eliminate the woodchips. Also, they work with the waste management professionals. 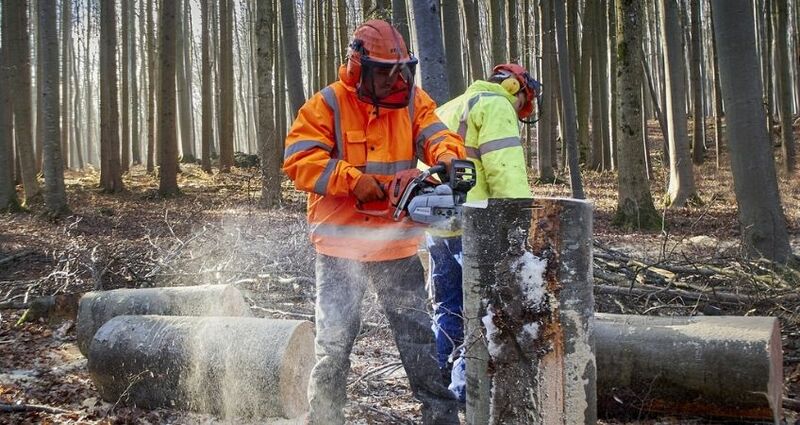 The experts know how to remove tree stumps without causing damage to the ground. Your plants, constructions, and other items will remain intact regardless of the size and root system of a stump. There are many myths you will find online on how to remove tree stumps without sweating. For instance, it is said that using chemicals and nitrate fertilizer will speed up the rotting process. Others will ask you to burn it with kerosene or use a chainsaw to cut the roots. The methods make the entire tree removal process difficult. It is easier and better to call the experts for assistance. A small tree stump is easy to remove and hence, you will be charged less for the services. In any case, you can try removing it using a mattock. The tool costs approximately £15 online. On the other hand, it will cost you more to remove a stump larger than five inches. You must call the professionals so that they can access the root system and the ideal method of removing it. Some of the trees are difficult to remove than others. Specifically, hardwoods require a lot of effort to remove because they take time to grind. They also remove smaller chips than softwoods. Hardwood examples are elm, hickory, oak, and birch. You will pay more if the experts spend more time cutting a tree stump. When a tree stump is located near a building, the experts use sophisticated methods to access and cut it without causing any damage. It will cost you more than when the stump is located elsewhere. 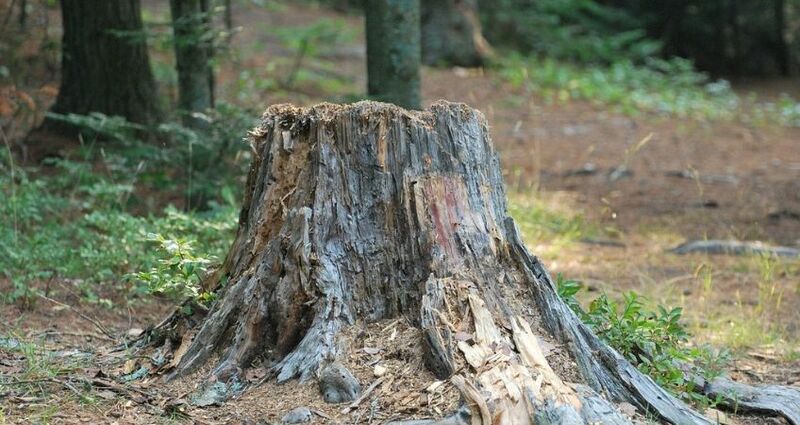 Older stumps are easier and cheaper to remove because they have rotted away. However, this should not give you a reason to wait until the stump has grown older. It may cause costly accidents if left on the ground for a long time. Below is an example of an old tree stump. 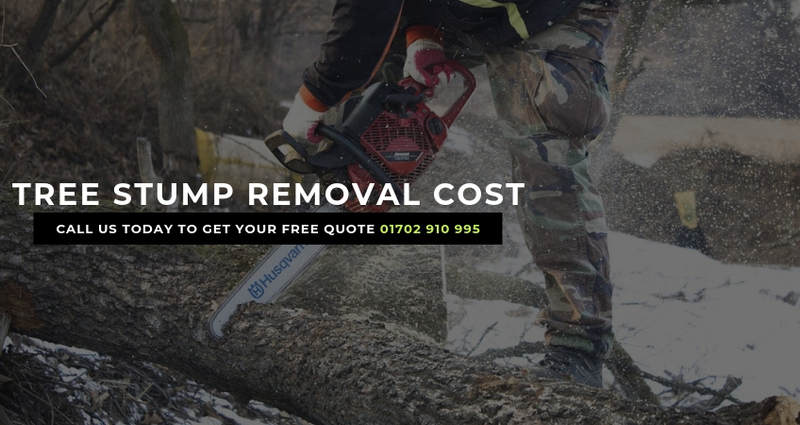 You will pay more if you are removing more than one stump. Rocky soil is likely to damage the professional’s equipment. You will pay more because the workers have to take their time to remove visible rocks and the soil before cutting the stump. It is costly when you want the experts to do away with the stump and the woodchips after the removal process. They will also charge you more if you decide to pay to install soil and plant grass or plants to create a perfect look. You are expected to pay taxes for the tree removal service. The experts will factor in the costs when offering you a quotation. Still, you must get a permit from the authorities at a small fee. The professionals may have to utilize ropes and climbing equipment depending on the location of the stump. This costs more. It can be hard to remove a tree stump, if it is located on a sloping ground. The experts will charge higher for the service than when they are dealing with a level ground. A tree stump located near a building is likely to be near underground cables. The experts must be careful not to touch them. They may also need to move the cables and pipes when it is absolutely necessary. There are many ways to remove a tree stump. The professionals will use the most effective method in a given situation. Some of the methods are more costly than others. The experts charge you more for labor, if they spend more time at a site. Even so, some of them will charge you for the entire work without considering the number of hours. It can be costly to remove tree stumps in some locations because of the high rates of taxation and charges for a permit. The experts will also charge you for transport, if you are located far from their offices. Some companies are generally more expensive than others. It can cost you as little as £77. You may also pay approximately £231, or even £616 depending on a company’s policy. It is hence important to do proper research on the prices before contacting a service provider. Nonetheless, you must not compromise on the quality of the services as you seek for better prices. The too-good-to-be-true deals must be avoided at all costs. There are moments when almost everyone in your neighborhood is removing a tree stump. This is because the weather is good enough to allow the experts to remove them without delays. You will pay more if you opt to call the experts during such seasons. Prepare the ground and clear the bushes to reduce on costs. Also, it is important to determine in advance where to take the waste after the removal process. You can work with the professionals who collect the woodchips for biomass production among other reasons. It is acceptable to test your negotiation skills by requesting for a good service rate. The service provider may be willing to take some of the costs from the quotation. You don’t have to remove a tree stump when everyone is doing it. Wait for the service providers to lower the prices or even give seasonal offers. You may end up paying half the price that you will be charged during peak seasons. It is still possible to find quality services at a reasonable rate. Go through different websites to determine whether the reviews echo the elements of professionalism, reliability, and affordability. A local company will not charge you for transportation services. They are also likely to be reasonable in their rate because they yearn to build a good relationship with the local residents. Certainly, you can find good rates for tree removal services. With the considerations to the aspects involved in coming up with a specific charge, do your search online and find an affordable company. Fortunately, you do not have to go to such lengths because Valiant Arborist is here to help. The company is reputable in offering vegetation management and grounds maintenance services in Essex and beyond. The rates are pocket-friendly.